sugar, baked, then glazed with pure maple syrup mixed with a little cayenne? Yeah, it's naughty good. The great folks at Burger's Smokehouse sent me some of their "crazy thick" (1/4") dry-cured bacon to try, so I thought I'd give it a proper treatment. Right out of the gate, let me say that this bacon is outstanding! Order some up, and thank me later. I spent about half of my childhood just down the road from them in Columbia, Missouri, so that makes it even more special for me. We have to support our smaller family-owned producers. OK, if you've never made or experienced pig candy, strap yourself in for a serious porcine indulgence. Mix the syrup and cayenne well in a small bowl and set aside. 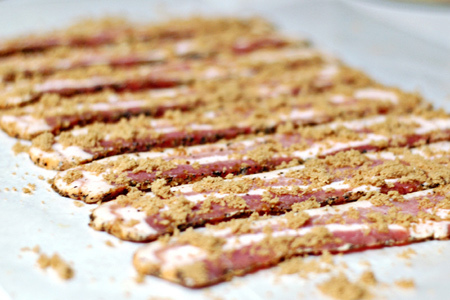 Coat both sides of each bacon slice generously with brown sugar. 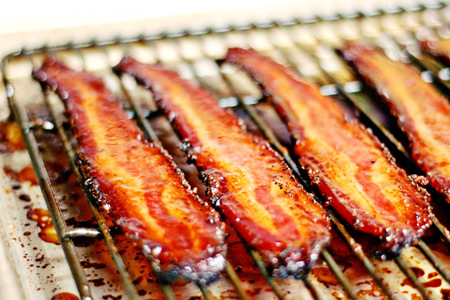 Arrange the bacon on a wire rack inside a sheet pan as shown. Note to self: Lining the sheet pan with parchment paper will greatly ease the clean-up. Bake in the center position until the sugar is starting to caramelize and the bacon just starts to crisp around the edges. This should take about 15 minutes, depending on the thickness of your bacon. Brush each slice with the syrup and bake another five minutes. Flip the bacon over and brush the other side with the syrup. Bake until the bacon reaches your desired doneness. Remove from the oven and let sit five minutes. Enjoy, but try not to eat it all at once. Note: If you like this recipe, try the praline version. Oh Yeah, That is the candy I love. How is that Burgers bacon on its own? Is it the old fashioned (very salty) country style? This recipe KILLS me, John. I love bacon so much it hurts. Oh my goodness, candy bacon, I am going to be in trouble with this. I have a terrible bacon fetish, can eat a pound by myself. Nice. I've been wanting to try this. I like the cayenne in yours. 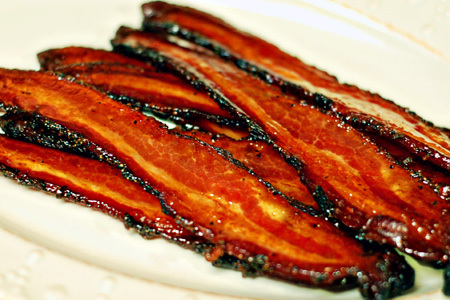 I live in Louisiana, and found this recipe for "Praline Bacon" on NOLA Cuisine. The picture makes my mouth water. I just made some candied bacon the other day and I was in heaven! It really may be the best thing ever. Wow, what can I say...this just looks delicious. I have never made pig candy before and never have even heard about it but I think you've got me hooked on it! WHAT. i need to make this. just started my own blog and im pretty sure i have to take a break from my own recipes to make this. looks great. yum. Oh this does look tasty. Hold the phone and lock the doors. Now that I got this recipe memorized. You can take this off the internet because I foresee a shortage in bacon and I would like to get to the store before they run out. I hope I'm not too late. Chopped up and stirred into maple ice cream, this is wonderful stuff! Everyone loved this last batch I made. I went one step further and dipped each bacon end in melted chocolate chips. Over the top bacon goodness! That's whole hog brother!